It's always a hoot-and-a-half to find deep spec authenticity. For example, I am intrigued by a line in one of the 800 letters Vincent van Gogh wrote to his brother Theo. The year is 1885 and Vincent is being covertly hostile to his little brother. He gives him a dig about what he was wearing in a recent visit to the parent's home in Neunan. Theo was by that time a bigtime art seller for Groupal, the company co-owned by their uncle, also named Vincent van Gogh, but called Cent. It doesn't help that Vincent was a total failure at selling art in his short-lived Groupal employ, attacking customers for their bad taste in art and taunting them to buy something better. Vincent's little brother, Theo, was everything that Vincent was not: smooth, polite and a good salesman. 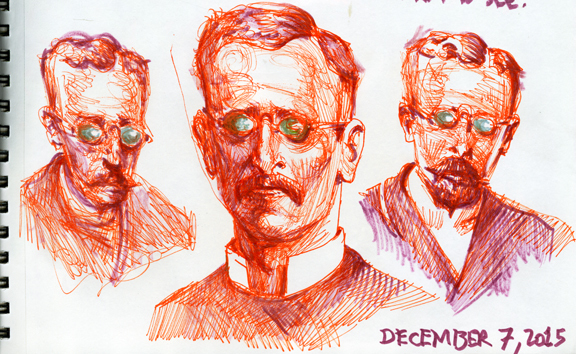 Daily Whip Out: "Theo In Ben-Franklin-Style-Sunglases"
Daily Whip Out: "Theo's Blue Pince-Nez Sunglasses"
Daily Whip Out: "Theo On The Nuenan Train Platform"
Vincent hated affectation of any kind. One time a visiting artist offered to look as his artwork and when he reached out to turn a page, Vincent noticed his cuff link and launched off on how much he hated anyone who would wear such ostentatious crap! 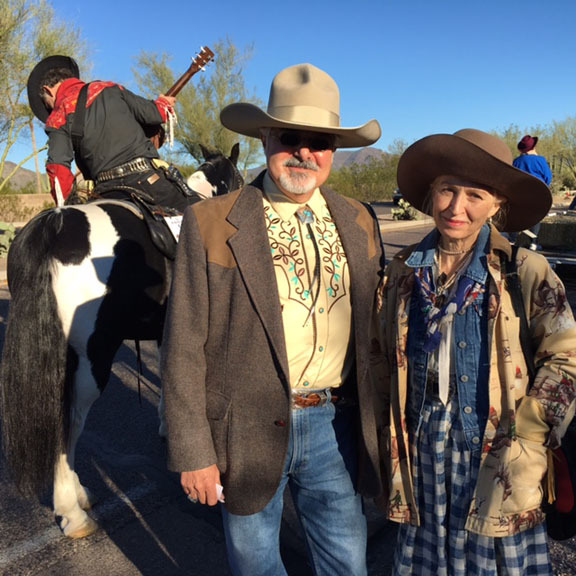 That's Gary, "The Horseback Singing Cowboy" behind them getting ready for the parade. "Since this summer I can’t help always visualizing you with your lorgnette with dark lenses. This doesn’t change a person very much, you’ll say. Maybe so — but my impression is that you have perhaps, in a sense other than the literal one, acquired dark glasses in what you think and do. Suspicion, for instance." "My future's so bright I have to wear shades." I thought pince-nez glasses had no side pieces - they just clipped on to the nose? From reading the actual Jan 31, 1885 letter it lists in translation for zwartglas as "black glass" and I agree with GoldLady probably no side pieces..Lorgnette as he wrote "lorgnet" in the letter.. Thank you Gay and Gold Lady. So, I am assuming he had black glass? 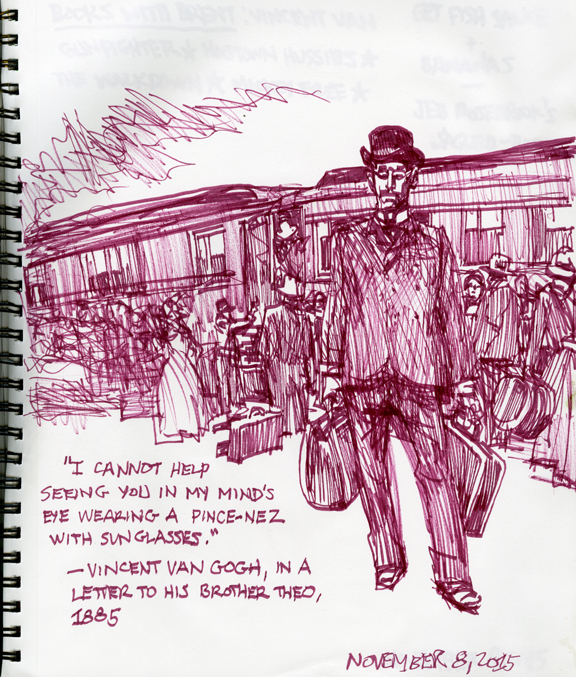 Maybe van Gogh was describing something along the lines of "Smoked Glass"
Your quick sketch (whip-out) adeptly captures the hustle and bustle of a train arrival. The art dealer where Theo (and Vincent, briefly) worked was called Goupil. Your quote from Vincent's letter to Theo gives another example of why Vincent was so hard to take. Here Theo was supporting him financially and morally, and he has the nerve to complain about Theo's dark pince-nez, saying they colored his thinking and behavior, making him "suspicious," for example. Thanks Murray. Yes, Groupil it is, not Groupal. And double yes on Vincent's insufferable attitude. He was a piece of work, that boy. Still love him, though. 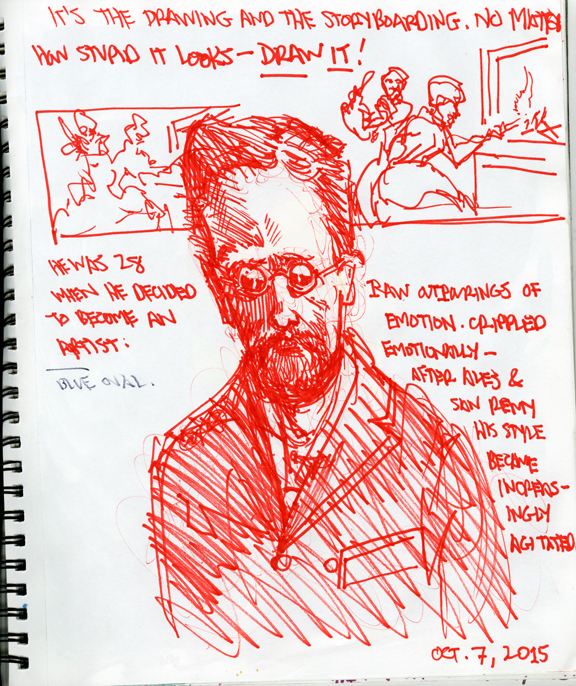 Pince-nez have no temples/arms over the ears. They have a spring steel bridge/nose piece that ''pinches the nose." Difficult to keep in place when active and very uncomfortable, although this did not hinder their popularity in the last quarter of the 19th century. Worn low on the nose for reading and high on the nose for distance. The reference to black glass is most likely very dark glass lenses of neutral/smoke (grey), green or possibly blue lenses. All appear blackish when worn. Tommyspecs, here's a question for you I have wondered about: if someone wore a monocle, did he/she have poor vision in just one eye? Also, did the wearer have to consciously scrunch it between the brow and upper cheek to hold it in place? Murray, usually poor vision would affect both eyes. When wearing a monocle, the eye with the monocle would become the dominant eye, whether the correction was for distance or near. Today, after cataract surgery, one option you may choose is to have one eye corrected for distance vision and the other eye corrected for near vision. The same can be done with contact lenses in order to eliminate wearing eyeglasses. Depending on the focal distance, one eye would become dominant eye. A monocle would work on the same principle. Monocles could be sized and fitted to an individual for a somewhat comfortable fit. You would need a good Optician. Off the shelf monocles were most likely uncomfortable and a sudden surprise or shock could send the monocle to the floor or into the wearers soup! Who Invented "The Doorway Shot"?